Combine all the dry ingredients ( flour, salt, sugar, baking powder, baking soda) in a bowl and mix well. Combine the yogurt and the luke warm milk. Make a well in the center of your flour mix, pour the yogurt and milk mixture and loosely combine all the dry and wet ingredients together. 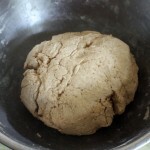 Grease your hands and form the dough into a rough ball. 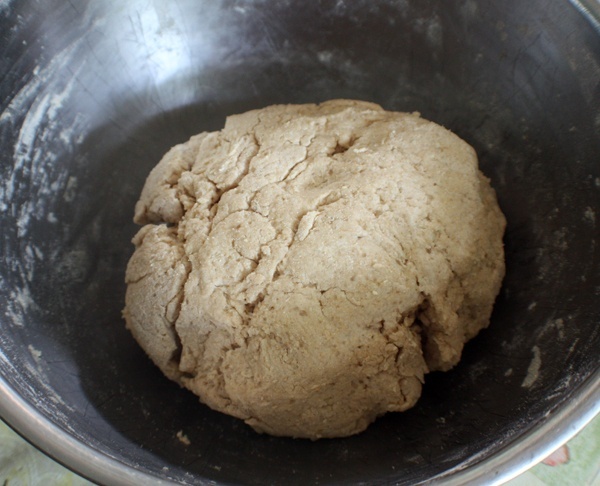 Do not knead the dough at this stage. 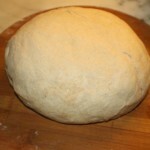 Cover the dough with a clean damp cloth and let it rest for 2-3 hours. 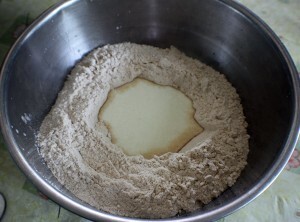 Dust your workspace with flour and knead the dough for 2-3 mins until it is soft and pliable. 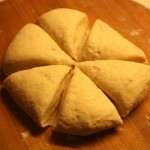 Divide the dough into 6-8 equal pieces and make into balls. 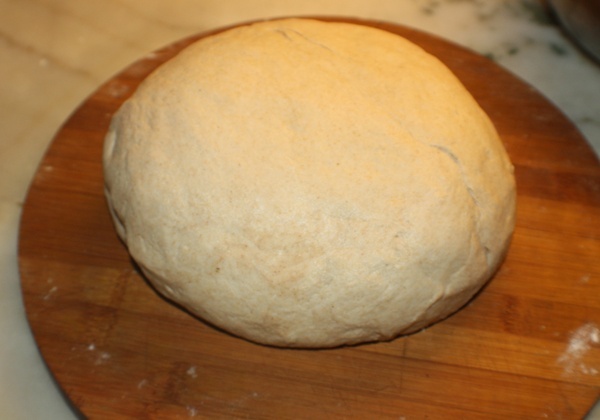 Sprinkle some flour on your workspace and roll out ball of dough into a slightly thick and elongated shape. 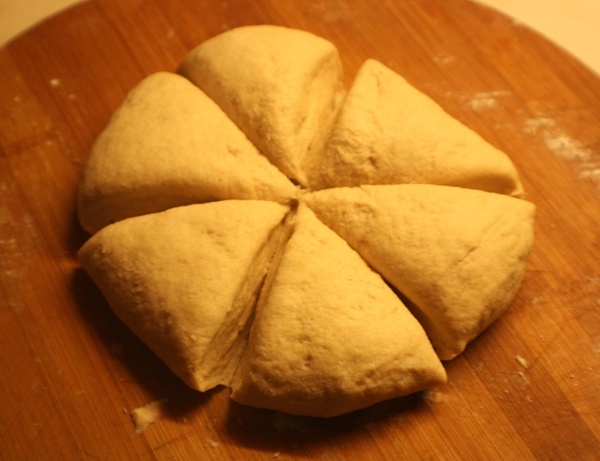 I used the rolling pin to flatten out the dough and then used my hand to stretch it into a tear drop kind of shape . You can season the naan with any flavor like garlic or toppings like Sesame seeds, Nigella seeds, dried fenugreek leaves (kasturi methi) . I used Nigella (Kalonji) seeds. Heat a skillet over high heat . 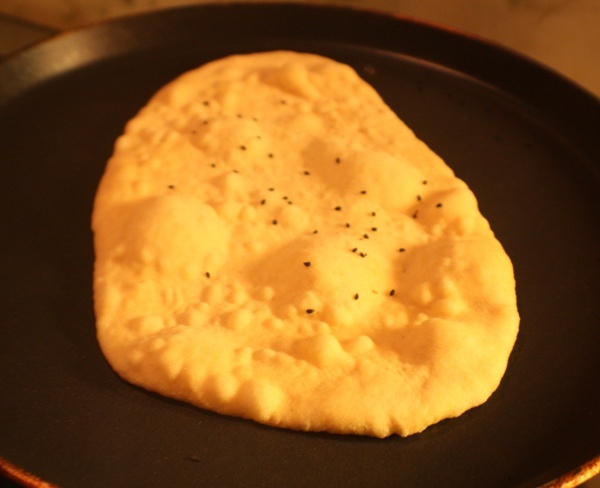 Brush with water, on the side of the Naan which does not have the seasonings and place your Naan, water-side down on the skillet. It will tend to stick. Don’t worry. 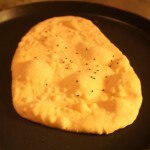 Cover and cook the Naan for 40-50 secs. 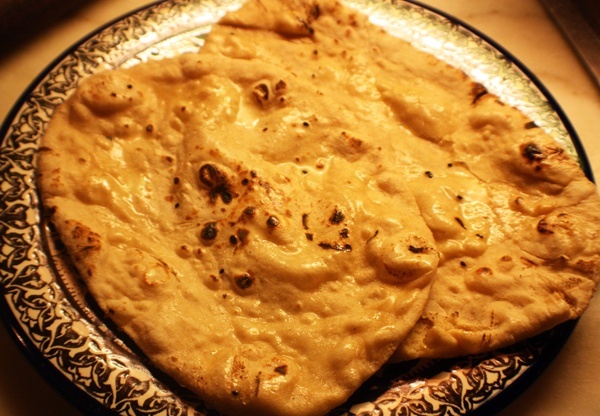 You know it is time to flip when bubbles start appearing on the surface of the Naan. Gently lift it and flip it over the over side and cook for 5 secs. Then to get the tandoor like Naan, use your kitchen tongs and hold the Naan ( the side that was not brushed with water ) directly over your stove flame for 20-30 secs rotating it constantly. This will give a nice roasted flavor and “out from the tandoor” look to your Naan. 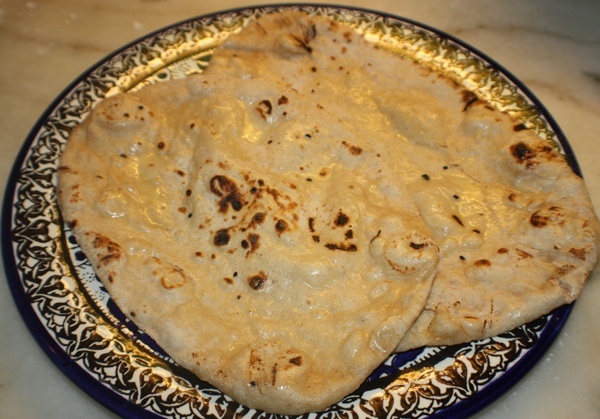 While your Naan is hot, brush it with melted butter and serve with a curry of your choice. 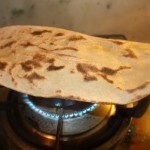 This entry was posted in All Recipes, Breads/Cakes/Rotis/Parathas and tagged Naan by Kamakshi. Bookmark the permalink.